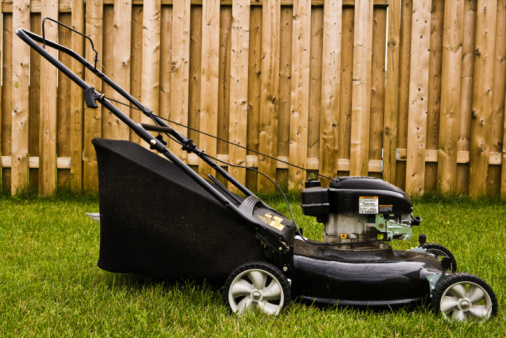 Although a little rumbling and shaking of the engine is to be expected on some lawn mowers, especially when moving over a bumpy lawn, excessive vibration from the engine can be dangerous. Vibrating can cause uneven cutting and damage the engine. Over time, shaking may cause the crankshaft of the engine to bend. If the crankshaft is bent, the mower needs replacing. There are other causes of engine shaking than a bent crankshaft though, and these can be repaired in an afternoon. A vibrating lawn mower is a serious issue that needs fixing immediately. Inspect the engine housing to see whether it is loose. Grab it once it is cool, and shake it back and forth. Tighten down the housing with a ratchet. Screw the nuts around the housing clockwise to tighten. Unplug the spark plug from the engine, and turn the mower over, keeping the gas and oil crankcase under the carburetor to prevent leaks. Inspect the underside of the mower for large debris. Remove any rocks or twigs. Place a block of wood at the bottom of the mower frame if the blade is bent. Even a small bend can cause the mower to vibrate. Push the blade into the block of wood to secure it in place. Remove the nut holding down the blade using a wrench. Spray the nut with a lubricant, and gently tap the end of the wrench with a rubber mallet to get the nut moving if it is stuck. Remove the blade. Scrape all the stuck grass off the frame once you remove the blade, using a putty knife. Place a new blade on the mower. Tighten down the nut to hold the blade in place, and turn the mower back over. Install the spark plug, and test the machine.